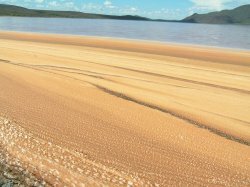 A few months before we arrived, Lake Bogoria suffered an unusual, unexplained event. The normally Spirulina-rich, blue-green water turned brown. The Spirulina had died out reducing photosynthesis activity. As a result, the oxygen levels in the water depleted which killed off large concentrations of chironomid larvae and, consequently, impacted the adult fly population. About 50 bird species, many of which are migratory, feed on the chironomids that float up through the water column or on the flies that emerge from the pupaes. However, with the lower chironomid concentrations, the migrating birds were nearly absent from the Lake. Luckily, in the short time that we were there, we’d seen evidence that the lake health was returning. Rafts of the blue-green Spirulina were visible again on the lake surface. The chironomid counts, though still low, were on an upward trend. 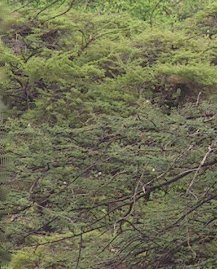 The swallows were returning and were busily eating Lake Flies, and the brown color of the lake was fading. However, right when we arrived, a brown foamy substance lined the shoreline. No one knew what it was and it disappeared a day later. It reminded me of the foam that I sometimes see in the ocean or washed ashore. Bacteria sometimes give off gases, which form bubbly masses on the water. 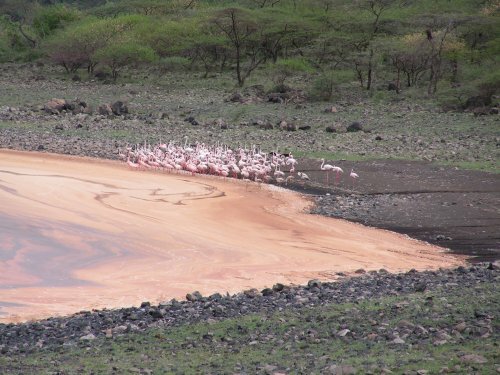 The presence of the foam did not seem to have an immediate effect on the flamingos or serve as a deterrent to flock to their favorite places. They continued to stand, sleep and feed in these waters. Spirulina (blue -green algae) -> is the primary source of food for the Lesser Flamingo. Spirulina that decays and falls to the bottom of the lake -> Chironomid larvae eat the decaying Spirulina -> The larvae become a source of food for the Greater Flamingo. Larvae become pupaes, which become flies. -> The flies and the larvae and pupae that rise in the lake’s water column become food for the swallows and other migrating birds. The Greater and Lesser Flamingos, become a food source for other wildlife including Tawny Eagles, Maribou stork, Baboons, Hyenas and Leopards. I went out on the Lake with Jo, Chris and Reuben. We were the first of the three groups to go out on Lake Fly assignment. By 7:30 am, we packed up the truck with a 4 person boat, a GPS unit, numerous plastic containers, ropes, filtration nets, an outboard motor, extra gas, Wellies (rubber boots) and something called an Eckman Grab. The Grab looks something like the claw used in that game to pick a stuffed animal out of a bin, only much larger. Reuben piloted us to several locations on the lake over the course of several days. We looked for earlier established transects to gather chironomid data that would be compared to data recorded last year. 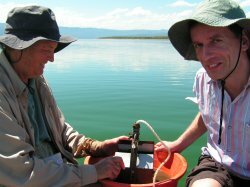 Once we identified a sampling location by GPS, we dropped anchor and readied the rest of the equipment to obtain a sample. The Grab was then gently lowered by rope into the water until it touched the bottom. With the rope pulled vertically and taut, we released a heavy weight that slid down the rope and “klunk!” hit the top of the Grab, only to release a set of jaws that enclosed on a sample of mud. Slowly the Grab was pulled up and a plastic bowl was placed underneath. After the water drained away, we took a peek inside to see evidence of any worm tubes in the mud. The chironomid larvae build muddy, tube-like structures around themselves on the lake bottom. The mud was stinky, evidence of deoxygenation. With my sensitive nose, the whiff was stronger for me than the others. Frankly, it smelled like a sewer. Disappointingly, the majority of the samples contained few or no worm tubes. Worse, after we washed the mud and sand away placing the sample in the filtration net, we found little evidence of larvae. 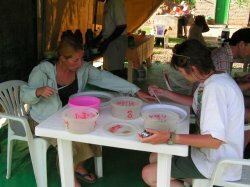 Still, we kept what we had and rinsed the remaining net contents into plastic containers. Once back at camp, we counted larvae and any pupae we could find and charted out the sample locations along the transects. The larvae were wriggly little things ranging in length from just over 1/36th of an inch to an 1/8th of an inch. Despite being so small, they were visible as most had a reddish hue to them. The color is attributed to a primitive form of hemoglobin. The exercise of searching for these little buggers was, strangely, rather meditative for me. In the end, the most robust samples only had a couple hundred larvae in them, though most came up empty. Comparing this count to last year’s in which each sample yielded counts of several thousand, it looked like the lake’s health was still suffering. However, by the time that Elfree and Kumar gathered their samples, the counts were on the rise. Out in the boat, as we slowly moved in the Lake, we ended up frightening away numerous flamingos. Though it was a beautiful sight to see them take flight, and I got a lot of good pictures, I felt terrible knowing that we were stressing the birds. The flamingos fly away, using up precious energy. Each day, if the concentrations of Spirulina are high enough, one adult flamingo must filter through 15 gallons of water each day to feed itself. In Lake conditions such as these, that effort probably needed to be doubled if not tripled.